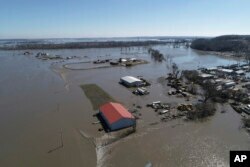 This March 20, 2019, aerial photo shows flooding near the Platte River in in Plattsmouth, Neb., south of Omaha. Passenger rail traffic along a popular Missouri route was suspended and evacuations continued Wednesday amid flooding along the Missouri River. This March 20, 2019, aerial photo shows flooding near the Platte River in in Plattsmouth, Neb., south of Omaha. The National Weather Service is warning that flooding in parts of South Dakota and northern Iowa could soon reach historic levels. 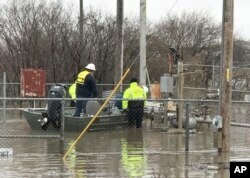 In this photo provided by the Missouri State Highway Patrol, Water Patrol troopers assist utility company employees in shutting off natural gas lines in floodwaters at Craig, Mo., March 20, 2019. "They've got water running down Main Street," said Tom Bullock, emergency management director of Holt County, where Craig is located. "Every levee we have just about is busted," Bullock said.